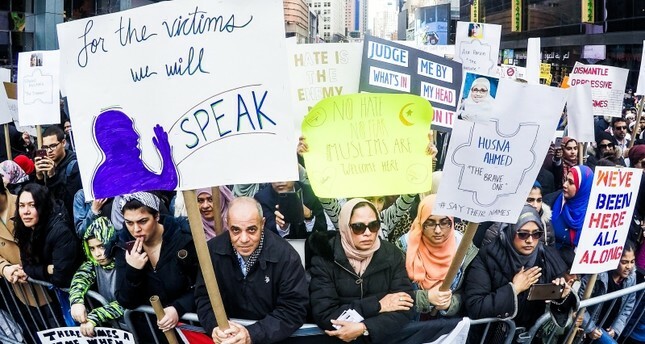 Members of the Muslim, Christian and Jewish communities joined together Sunday in New York City to deliver a message of unity against anti-Muslim racism, in the wake of the devastating terrorist attacks on two mosques in Christchurch, New Zealand. Parts of the Quran were read during the gathering in Times Square. "We are here today for solidarity with our Muslim brothers," Rev. Robert Johnson told an Anadolu Agency (AA) correspondent at the rally. "Whatever the religious group, all kinds of violence are false and evil," he said, expressing his deep sorrow over the Christchurch attacks that left 50 Muslim worshippers dead. A Jewish leader at the gathering, named Michael, condemned all forms of racism and hate speech, calling on communities to be brought together against the growing threat of white supremacist ideology. A New Zealander living in New York, named Stephanie, told AA that she regretted what had happened in her country. "I'm here today to support my brothers and sisters," she said, adding that New Zealand is a country that welcomes and supports all people. Co-chairperson of the Turkish-American National Steering Committee (TASC), Halil Mutlu, said that the Turkish-American community strongly condemns this horrendous attack. Mutlu said the terrorist attack was committed against all mankind, not only against Muslims. Millions of people around the world share the pain of the Muslim community, he said, adding that a common voice and unity will overcome hatred and white supremacy. Meanwhile, in front of the White House in Washington, D.C., over a hundred Muslim American citizens gathered to protest the anti-Muslim policies of President Donald Trump's administration.